The pioneering Channel F was the first games console to feature interchangable ROM cartridges. 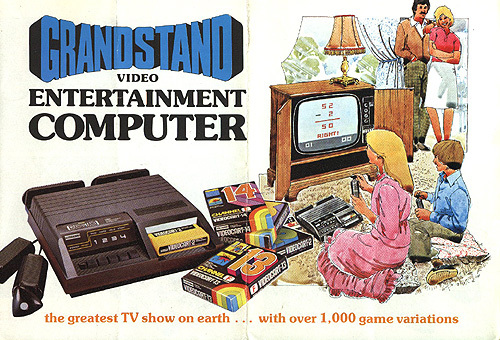 It was also the first home games console with enough power to run one player games verses the computer's very basic artificial intelligence. To play the games listed below you will need to use the MESS emulator. To use game accessibility utilities you will need the version provided at OneSwitch or elsewhere that has "Direct Input" support. It had the first commercial one-switch video game for home use in the 1976 Videocart1 game "Shooting Gallery". This was later used with on-line speech control in the 1978 shows TV Powww and TV Pixxx. Ten-pin Bowling for one or two players from 1978. Aiming automatically varies from left to right until the player pushes their joystick. Can be played one-switch style in this way. Videocart 1 includes four titles. Shooting Gallery, Tic-Tac-Toe (noughts and crosses), Doodle and Quadra-doodle. 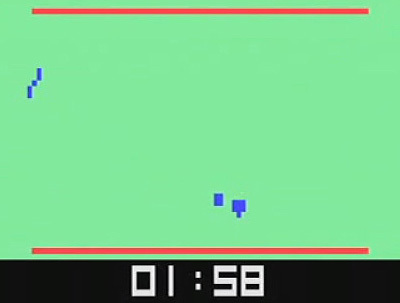 A 30 second version of Shooting Gallery was used in the television show TV Powww and TV Pixxx (see video below). VES Wiki: Deep info on the Channel F.
Wikipedia Channel F: Info on the basic history of the Channel F.
Wikipedia TV Powww: A little on the history of TV Powww.